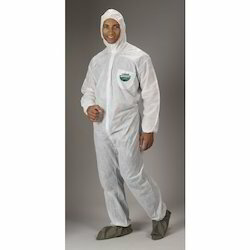 Shiva Industries deals with vast range of Disposable Chemical Clothing. Lightweight and breathable material for maximum user comfort and wearability. Tightly bound seams providing and improved particle resistance and a better strength than standard stitched seams. Lightweight and breathable Type 5 & 6 protection. Safegard GP is ideal cost effective protection against hazardous dusts and light splashes and sprays of low hazard liquid chemicals. 1. Protection against hazardous dusts and light splashes of low hazard liquid chemicals. 4. Wood and metal processing. 5. General maintenance and cleaning applications. Three piece hood and two piece crotch gusset for improved fit and wearability. Category III (Complex) product – designed for protection against hazards. Type 6 (EN 13034) protection against reduced sprays (light splashes and sprays) of liquid chemicals. Two-way stretch film results in good strength properties. Meets the requirements of EN 1073-2: Protection against particulate radioactive contamination. Biological penetration : Fabric has passed the US Test ASTM F1671-97a against penetration of microbiological bacteria. Looking for Disposable Chemical Clothing ?